Looking for a painless $100 million? Where can Toronto Community Housing get the $100 million a year it needs to fix up its buildings? So far, it has come up with one answer: sell its 700+ stand alone properties, and invest the proceeds in low-risk deposits. According to the TCH staff report, that strategy will gross $16.8 million per year at a “conservative” return of 5%. After it takes into account the rents lost by selling these homes and moving tenants into other TCH buildings, it expects to get $12 million a year. Of course, most people I talk to think a projected 5% return is anything but “conservative.” But even if we accept TCH’s optimistic projection, we’re still talking about solving only 12% of the problem. So where else can TCH turn? The only sources of “big money” are the federal and provincial governments, and they’re not lining up to throw money at the City. The City of Toronto subsidizes the Ontario Government for every social assistance recipient living in social housing. That’s because social housing tenants don’t get the full shelter allowance – an allowance paid (mostly) by the Province – they would get if they lived in a privately-owned building. Instead, they get a much smaller shelter allowance, and Rent-Geared-to-Income subsidies –- money paid entirely by the City — make up the difference. A November 2007 staff report to a City Council committee estimated this subsidy to the Province cost the City $77 million per year. Today that figure will have grown by at least the Consumer Price Index. The City of Toronto is also picking up the tab for the Federal Government. In 2007 Toronto received $174.5 million in Federal subsidies. 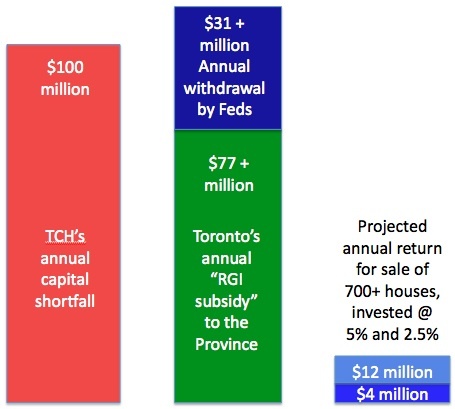 By 2015, when TCH hopes to have sold many of their stand-alone homes, those subsidies will have been reduced by $31 million per year. By 2029, they will have dropped to zero. These subsidies are tied to the mortgages of social housing developed before 1993, when the Federal Government pulled out of new housing development. The theory was that costs go down as mortgages are paid off. But federal subsidies were never tied solely to mortgage payments; they also provide subsidies to low-income households. These costs have increased, not decreased. And all the while, the buildings are deteriorating. Who is on the hook for keeping these buildings in good repair, or ensuring they keep on housing the people they were designed to serve? When it comes to Toronto Community Housing, it’s the sole shareholder – the City of Toronto. I don’t for one minute think that TCH can tap this money simply by alerting the authorities. The authorities already know, and so far nothing has changed. But perhaps it’s time to try again. We know the costs of the “12% solution:” tenants will lose their homes; Toronto will lose 700+ affordable family-sized houses; and even more low-income people will be pushed from the downtown to the inner suburbs. Would we be willing to spend ten times the energy to get ten times the money — and find a lasting solution? They could stop building new buildings (this has not stopped TCHC is building all over the city) they spend billions yearly when they should use the money to fix what they already have (10% of their apartments have no tenants in them).